Life Candy: come on. show me yours. delurking day 2011.
come on. show me yours. 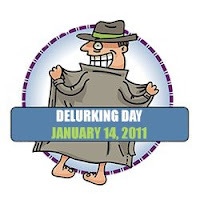 delurking day 2011. It's that time of year again! (Do I start every Delurking Day post that way?) Yes, my lovely internets, it's the time of year when we bloggers get all "leave-me-a-comment"-y! Actually, I almost forgot it this year. Thankfully, the manly, fragrant, and rarely sticky Rude Cactus emailed all of his bloggy cohorts to remind us all of this special event and give us the lovely graphic you see over to the left. Whether you're new to Life Candy (welcome to my brain farts! ), a devoted LC commenter/emailer, or a shy LC fan, now is the time for you to flash me (like that graphic dude) one of your comments. Bare it all, baby! It's okay! First of all, if you would normally hit "Anonymous", hit "Name/URL" instead. You can leave just your name -- URL is optional. But if you do leave a URL, I will come by and comment! 5: or a combination of the above. 4. Congratulations! You do know that grandparents are expected to spoil their grandkids, right? 5: Yo! Blue! Toast! Congrats! HI! Well I'm not de-lurking because I always comment here, but just stopped by to say hello anyway. Hope you're doing fabulous, pretty mama! Hope you're keeping warm! Just think - spring is ALMOST here! 4: Congrats, Marlo! grandparents rule! mine sure did! 5: sup?, black, ugh, woohoo! Yo, hello and hidey ho!!! Congratulations to your generations arrival at "grand" status. I had a cupcake for breakfast... with sprinkles! Breakfast of champions! Breakfast taco and snickers mocha. 1: Well hello. Haven't seen you in awhile but you and your family are near and dear to our hearts. 4: For cousin Marlon - better you then me. My eldest daughter is just becoming a teenager and I'm afraid ... very afraid. I find peace in cleaning my shotgun. 5: On the playback list for today - Volbeat, Blue Rodeo, Megadeth, KT Tunstall, Rory Gallagher and Wo Fat. Throw in a box and mix well. into the shadows I return until next year. My father in law calls me Dan Boy.